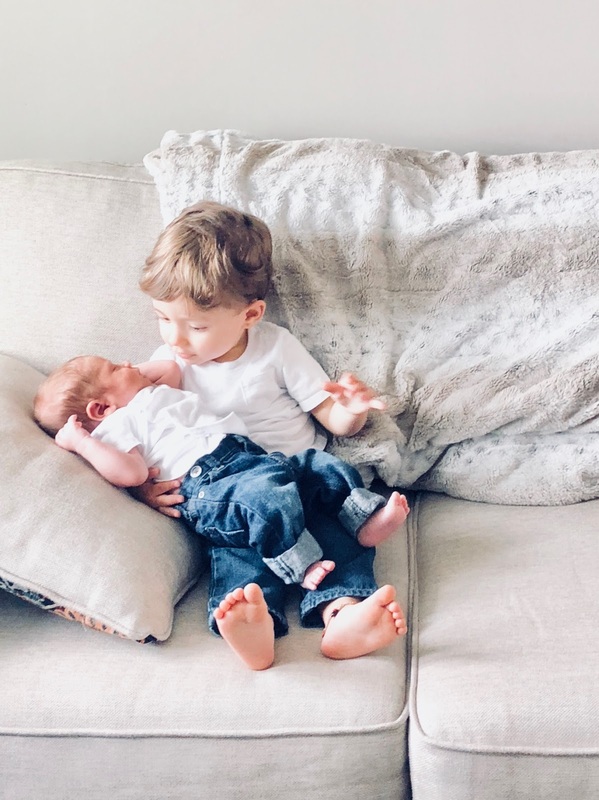 I spent much of my second pregnancy wondering how my heart could love another baby as much as I love S. What everyone told me was true, though: Your heart just does. I felt anxious during our drive home. After all, I knew the return home would be a bit tough. Since S was sick, he hadn't yet met R and he would still have to keep his distance from R.
When we arrived, S was sleeping. I went to his room, knelt beside his bed, and cried. I was elated to see him but I felt bad I hadn't cared for him the past few days, and I brought a new baby home while he was under the weather. He'd have to share me and he didn't even feel well and he was no longer an only child. So. Many. Emotions! Thankfully, their meeting went well. Fast forward a day or two, and S wanted to be picked up but I couldn't pick him up due to my C-section. So, I knelt down and tried my best to explain my boo-boo prevented me from being able to carry him. He didn't really get it and so we cried together on the kitchen floor as I held him. We celebrated S with a Big Brother cake with family the weekend after R was born. I've included him in feedings by letting him taste and drink my breast milk, upon his request. I always tell him how much I love him and encourage him to carry and play with his little brother (supervised, of course). I nurse R and I really love that I do. It gives me comfort knowing we share a special connection and one-on-one time because his alone time with me is almost nonexistent aside from feedings. Suffice it to say the transition was not super easy. Sharing my heart and my love is not easy, either. My attention is constantly divided between them and at the end of the day I often wonder whether I gave each of them enough of me... And then I realize: I give them both basically all of me and surely, that's more than enough. I don’t know if it ever gets 100% easier to share our hearts and time with multiple babies but I think we just figure out a way to best do it. Moms have been doing it for all of eternity so I know I’ll be just fine. Mama, you will be, too.